The Red Flag with the Yellow Star. The Nguyen Dynasty was the last ruling family to rule over Vietnam, coming to power in 1802, and remaining on the throne until 1945. The first flag that they used was the Dragon Spirit flag. A yellow banner, with a red disc in the centre. The flag was edged on three sides in white, and had blue flames running round the white stripe. From 1885, the flag was altered to a yellow banner with Vietnamese script, declaring the Kingdom of the Great South. From 1859, the French where making slow inroads into Vietnam, with treaties, and military action. By 1887, Vietnam became part of French Indochina. The flag the French used for their Far Eastern territory was a simple yellow banner, with the French tricolour in the upper hoist canton. Yellow is a very important, regal, colour in southern Asia. 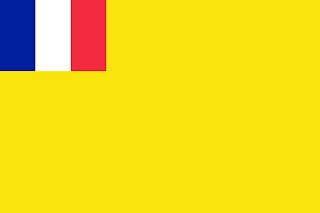 In 1890, the Nguyen Dynasty changed their flag again, this time switching to a yellow field, with three red stripes running horizontally across it. In 1920, the final flag of the Nguyen Dynasty was instituted. This time, the three red stripes where replaced with a single, thick, red stripe. During WWII, Japan invaded Vietnam, and threw out the French, installing a puppet regime, headed by the Nguyen family. This saw a return to the three stripe flag, though the middle red stripe was broken in the centre. However, a Communist uprising, led by Ho Chi Minh rose to fight for independence, both from France, but first, from the Japanese! Their banner was a Communist red banner, with a large, slightly rounded yellow 5 point star. Post WWII, the French tried to reclaim their territories, however, they had to fight a continual war with the Vietcong. The southern third of Vietnam became the autonomous Republic of Cochinchina, and their flag was a yellow banner with three central stripes. This time, however, blue. 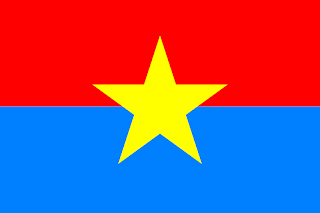 In 1948, the rest of the south of Vietnam was merged, to create the Republic of south Vietnam. Returning the flag to the three red stripes. Ho Chi Minh led his forces to a series victories over the Japanese, and declared the Democratic Republic of Vietnam to be independent towards the end of the war. However, as a result of negotiations with the Chinese, and French, he acceded to the French returning, under the proviso that there will be independence soon. The DRV took the flag of Ho Chi Minhs forces as their flag. However, this did not stop the fighting, and the North Vietnamese inflicted severe losses on the French, and in 1954, the Geneva Accords saw the establishment of the State of Vietnam in the south, and the Democratic Republic of Vietnam in the north. The DRV altered their flag, cleaning up the star, to make it sharper. By 1956, an insurgency began in the south, started by the Viet Cong, and backed by the North. Exploding into full scale war by the mid 1960's. The North slowly began to overtake the South, and the South's government began to crumble. In 1969, the Provisional Revolutionary Government of the Republic of South Vietnam was formed, a communist government allied to the north. The fighting however, against forces of the south continued until 1975. The Provisional Government adopted a flag similar to the north, however, with the lower half of the flag being a light blue. 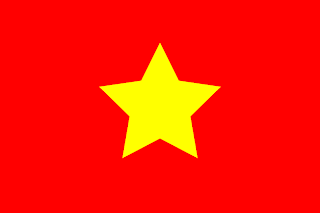 The two Vietnam's merged in 1976 as the Socialist Republic of Vietnam. 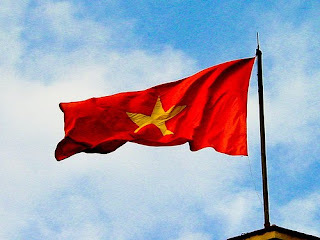 Finally reunifying the nation, and adopting the flag of the north as the flag of the new Vietnam.